Speed dating at Chicago Comic-Con, hosted by George Pérez. It's on! The Hero Initiative is proud to have helped John Ostrander over the past few years with some financial aid and drumming up some work. Now, Mike Gold and Adriane Nash are putting a mighty shoulder to the wheel as well. They've cooked up Comix4Sight, and are planning a killer auction at the 2009 Chicago Comic Con. Proceeds will go to John to help with medical and travel expenses as he battles glaucoma. And ya know what? If they raise funds above and beyond John's needs, those will kick over to pthe Hero Initiative. That's just the kinda great guys and gals they are. So visit the auction and bid GENEROUSLY. Just don't bid on that American Flagg! page, huh? That sucker's gonna be mine. Official announcement and hoo-hah in a couple days. And a kickoff event at the Chicago Comic Con that, even by Hero's standards, will be quite wacky, fun, and bizarre. If we've said it once, we've said it, well…more than once, I'm sure. 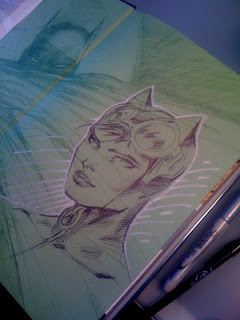 …including this GREAT Catwoman below! 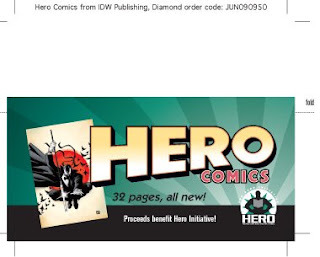 Hero Comics on the way! It'll be at the Hero booth, #907, at San Diego. 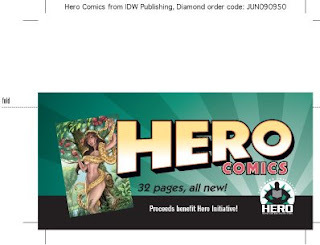 And for our retail brethren, downloadable shelf-talkers for store use are also available at the Hero Website. Eat ’em up like candy! The last dog is hung, the last glass is dry, and after 24 hours of recovery, the Hero Initiative/Meltdown Comics 100 Bullets farewell party is in the books. We'll figure out just how much the piano tuner charged us to tune a piano, but thanks to a DAMN vigorous auction, the night was both fun and profitable for Hero. Take a look-see folks. 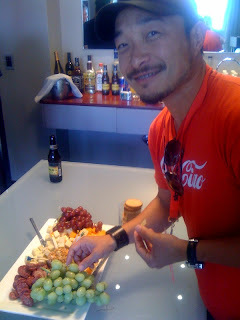 All photos were taken by and are courtesy of Lori Matsumoto, who's available for all your photography needs! Up top: The Rev. 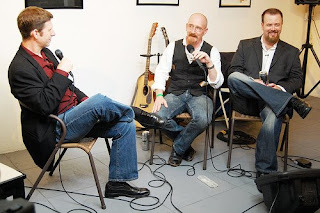 Dave Johnson, Jim McLauchlin, Brian Azzarello. A major portion of the evening's festivities was a q-and-a with Azzarello and Johnson, hosted by Jeffrey Berman (above) of TheWriteEnvironment.com. Music was provided by the amazing Nina Storey and Ryan Franks! 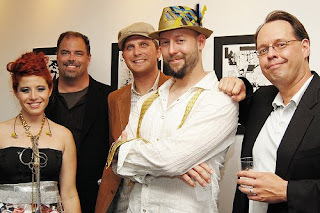 L-R, that's Nina, manager Bill Bennett, ASCAP's Josh Briggs, Ryan, and a doofus with a drink. 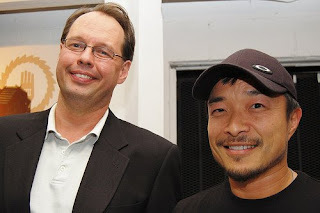 Several comic book-y luminaries showed up, such as Jim Lee (above). Paris Kennedy (l) and Sam Humphries (r) ran an auction which grossed $4900 on only seven items! The great Dave Johnson "Megan" piece above sold to BOOM Studios' Ross Richie for $1100. Of course, none o' this happens without the efforts of MANY fine folks. L-R above: Hero Development Director Christina Zietsman, Sam's Afro, half-drunk doofus, and Hero volunteer Diana Knight. 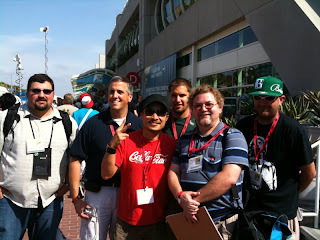 More photos are at a Flickr page, and will continue to be updated, so keep checkin'. Seriously, if you weren't there…what the hell is your problem? 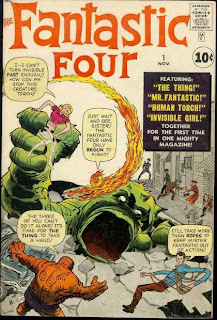 Marvel Editor Tom Brevoort reaches the end of "Take My Trade" with a coveted copy of Fantastic Four #1! Or does he? Tune in, True Believers! Man, I think that's all you need to know! It ain't just 99-cent shrimp cocktails and all the keno you can lose at! Vegas is also the place to get your Batwoman on! 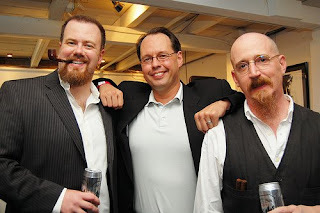 The stellar creative team of Greg Rucka and J.H. Williams double-down with TWO Las Vegas store appearances on July 11 to promote Detective Comics. Early risers or late blackjack players should head to Alternate Reality Comics from 11 AM to 2 PM, while later shifters can shift to Comic Oasis from 4 PM to 7 PM. Either way, YOU win, and the stores are doing Hero Initiative fundraisers as well, so get ye there! 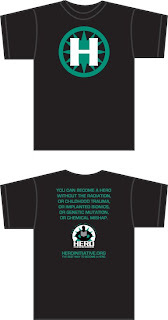 NEW Hero T-shirt debuts at 100 Bullets party! And lo, there shall come…a new T-shirt design! 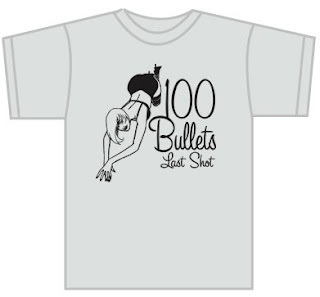 Folks smart enough to buy a VIP ticket to the 100 Bullets: Last Shot party July 11 at Meltdown in L.A. will get, as part of their VIP package, a T-shirt. And it's your choice. The 100B shirt seen above, or the NEW Hero T-shirt, uh, also above. Crazy visual hyperkinetic you-gotta-be-there bonus: The Hero shirts will be pre-made and ready for you to pick up. The 100B. shirts will be live screened ON SITE . Tell ’em what size you need, and the crew from Blue Rooster Art Supplies will make it RIGHT before your eyes. It's kinda like going to the taco truck and ordering lunch. I like mine with lots of cheese, and just a smidge of guacamole. VIP tix holders also get super-cool 100 Bullets shot glasses, and one hair plucked from the beard of Brian Azzarello. He's got a lot to spare. And if you're so lame you don't make the scene, the new Hero shirts will also be available at The Beast Men Call San Diego. 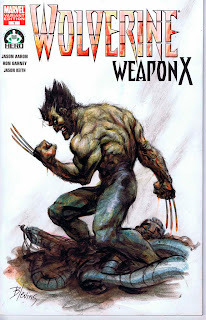 Wolverines keep rolling: Bret Blevins! 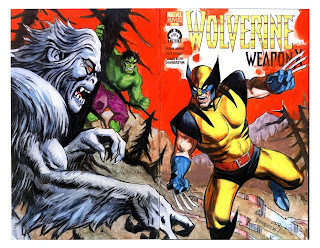 The supremely talented Bret Blevins has made his contribution to "The Wolverine 100 Project!" Look on it, and drool!